Logistics company Matternet will set up a permanent autonomous drone network in Switzerland. It will transport lab samples like blood tests and other diagnostics between hospital facilities, clinics, and labs. Similar networks have recently been set up in African countries such as Ruanda and Tanzania. The first delivery network will be operational starting next month, according to The Verge. Several more are to be introduced in the next year. Matternet says medical items can be delivered to hospitals within 30 minutes. The same goes for the drone networks in Ruanda and Tanzania. In the last country, hundreds of drones will deliver blood, medicine, vaccinations and other medical supplies to country hospitals in remote areas. Zipline is operating the networks. US based Matternet was granted authorization to operate its drones over densely populated areas in Switzerland in March. 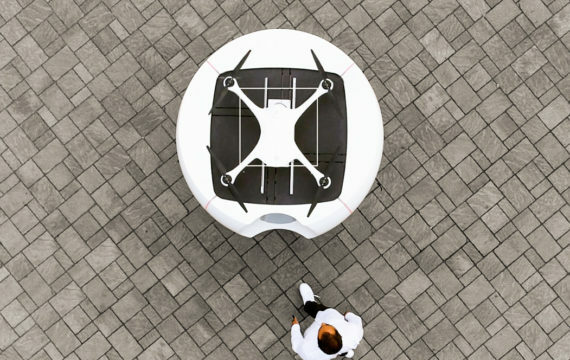 It says that approval was a world first.The company last week unveiled a Matternet Station; a kind of white, futuristic looking postbox with a footprint measuring about two square meters, that can be installed on rooftops or on the ground to send and receive packages by drone. The drone network is part of a partnership with Swiss Post. According to both parties involved, it is significant because it’s the first operational drone network flying in dense urban areas that’s not a pilot run or in testing. A pair of hospitals in Lugano in Switzerland had previously tested Matternet drone flights to deliver lab samples. Matternet plans to establish a regular service starting in early 2018. Users operate the system via an app to create shipment details. Items are placed into a compartment box in the station before being loaded into a drone for delivery. Currently the drones can hold up to 2kg (4.4 pounds). Packages are then flown to another Matternet station, where receivers can obtain their package by scanning a QR code. Recently, drones were introduced on a pilot basis to show they can deliver aid in cases such as cardiac arrest. New research from the Centre for Resuscitation Science at Karolinska Institute and Stockholm South General (Söder) Hospital in Sweden shows that a specially constructed drone, equipped with a defibrillator, can be dispatched by alarm and delivered automatically to the site of a cardiac arrest long before an ambulance arrives. As with drones for medical supplies, an important use case is that drones can get to an emercency in remote areas much faster than an ambulance.